The Bayfeld Concert Series is celebrating its 10th anniversary of bringing musical entertainers to town with a quartet of shows from well-known performers including Sarah Slean, Ron Sexsmith, Sass Jordan and the Good Lovelies. Signed to Atlantic/Warner Records at the tender age of 19, three-time Juno nominee Sarah Slean has since released 11 albums in over 10 countries worldwide – but perhaps the most astonishing aspect of her artistry is its breadth. Over her 20-year career, Slean has published two volumes of poetry, starred in short films and a movie musical (spawning two Gemini Award nominations), penned two string quartets, held numerous exhibitions of her paintings and shared the stage with eight of the country’s professional orchestras. Classically trained from the age of five, she routinely collaborates with cutting-edge contemporary classical ensembles like The Art of Time, and has been invited to sing world premieres by Canada’s leading living composers. Citing such diverse influences as Leonard Bernstein, Philosophy, Joni Mitchell, Buddhism and Bach, her music borrows aspects of cabaret, rock, pop, and orchestral: all knit together by the startling poetry of her lyrics, virtuosic piano-playing, and that voice, described by the CBC as “a 19th century Kate Bush”. In addition to headlining theatres across Canada, Slean has also toured Europe, the US and Scandinavia and has opened internationally for such artists as Bryan Ferry, Rufus Wainwright, Alanis Morissette, Andrew Bird, Feist, Ron Sexsmith, Chris Isaak and Buck 65. “Metaphysics”, her first recording in five years, is described as a breathtaking amalgamation of Slean’s dramatic orchestral arranging and her signature take on songwriting. Slean will grace the stage at the Bayfield Town Hall for a matinee performance on Oct. 22. 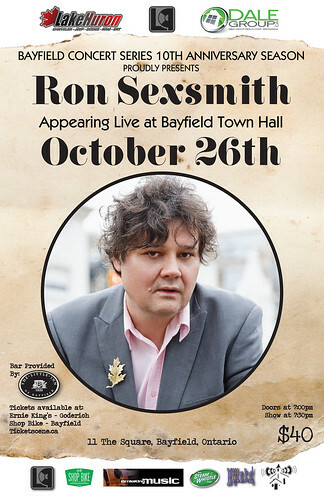 Ron Sexsmith is a favorite of Bayfield concert attendees and he will be back in the village for a performance on Oct. 26. 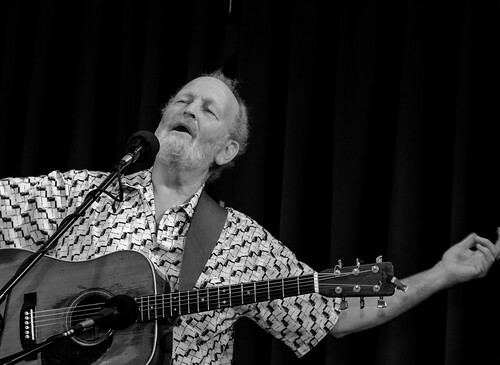 His latest album, “The Last Rider” was released in April giving audiences an opportunity to hear new music as well as their favorites from a career that has spanned more than a quarter-century. 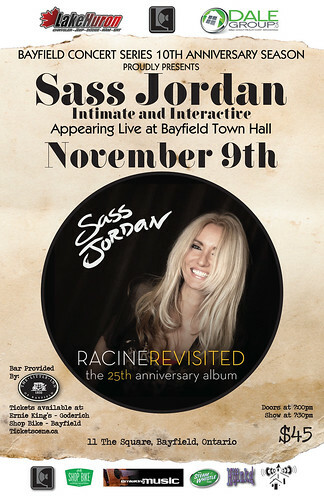 Canada’s Queen of Rock, platinum selling, Juno and multiple award winner Sass Jordan, is making a stop in Bayfield on Nov. 9 as part of her “Racine Revisited Tour” to celebrate the 25th Anniversary of the release of her 1992 Sophomore album, “Racine”. This album made her an international success and produced some of the most memorable songs of the 90s including: “Make You a Believer”, “I Want to Believe”, “You Don’t Have to Remind Me” and “Goin’ Back Again”. “Racine Revisited”, a brand new rendition of the classic album, was released on Sept. 15 via True North Records, and the Racine Revisited Tour should be an unforgettable night for Jordan fans. It's a chance to hear this timeless record performed live in its entirety. The show will consist of two 45-minute sets, stripped down with some stories from Jordan, and a Question and Answer element woven into the show. 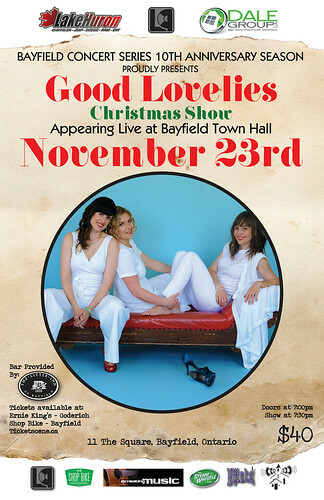 Still merry after all these years, the Good Lovelies will be headed across Canada this November and December with their annual Christmas show returning to Bayfield for a performance on Nov. 23. Accompanying the Good Lovelies (Caroline Brooks, Kerri Ough and Susan Passmore) is their band of merry men - Steve Zsirai and Robbie Grunwald on upright bass and piano. As a five-piece, this band will have audience members humming along, laughing and full of mirth by the show's end. Fans should keep an eye out for their new release, “Shapeshifters”, coming February 2018. 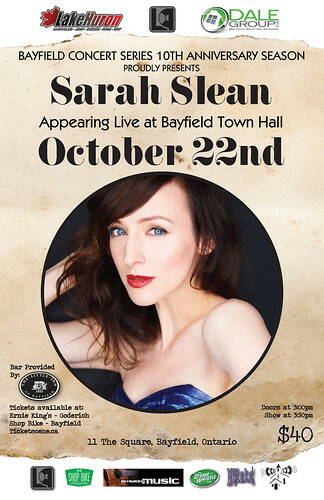 All shows are held in the Bayfield Town Hall and begin at 7:30 p.m. except for the Sarah Slean concert that will begin at 3:30 p.m.
Tickets are available for these licensed concerts from Ticketscene.ca, Ernie King Music in Goderich and Shop Bike Coffee Roasters in Bayfield. Tickets are $40 each with the exception of the Sass Jordan performance that is $45. Any local artists that might be interested in performing as an opening act at any of these concerts should contact Peter Meades at pmeades@hotmail.com. Those who attended “The Dreamboats” concert at the Bayfield Town Hall on Friday, July 21 enjoyed an amazing, high energy Rock N’ Roll concert, but they also helped Michael’s Pharmacy celebrate their 10th anniversary in Bayfield. 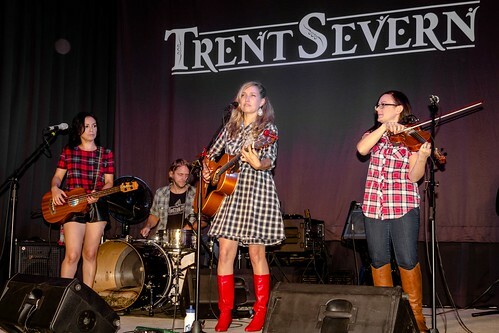 Kelsey Johnston, a Michael’s Pharmacy employee, organized the sold-out concert as a fundraiser for the Bayfield Town Hall Heritage Society (BTHHS). As a result, the Town Hall recently received a donation of $2,000 from Michael and Nevien Ibrahim, for the net profits from The Dreamboats concert. 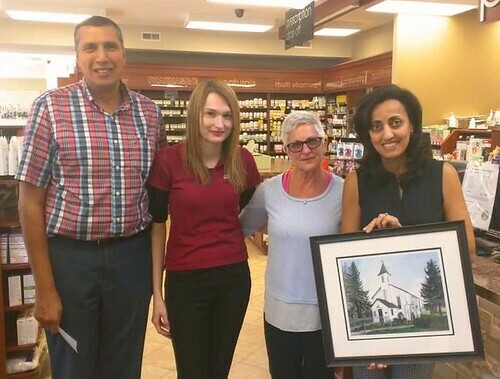 Sandy Scotchmer, president of the BTHHS, was on hand at Michael’s Pharmacy to accept the donation and once again thank Michael, Nevien and Kelsey for their support of the Town Hall. The money will help with ongoing maintenance and renovation projects. And as special note, with the assistance of Johnston, the Town Hall has arranged for a return of The Dreamboats on June 28, 2018! Two motions put forth by Bluewater Council from the Committee of the Whole Session on Sept. 5 regarding the future of the Bayfield Arena and Community Centre were tabled at the Sept. 18 regular council meeting. Bayfield Ward Councilor Bill Whetstone suggested that this motion be tabled for clarification on terms of reference in a staff report. Deputy Mayor Jim Fergusson added that the report could include what other municipalities have done. Whetstone suggested that staff create an informational report to determine what the value of entering into either a lease or a purchase agreement would be to Bluewater. Conversation arose as to why money was being spent on the Bayfield facility at this time when its future use is in question. Manager of Finance Ansberth Willert noted that it is a health and safety issue, the roof was deemed to have failed last spring, and now that work on the roof trusses has been completed the municipality needs to protect that investment now. An online petition has been created regarding the proposed development at 89 Main Street South in the village. 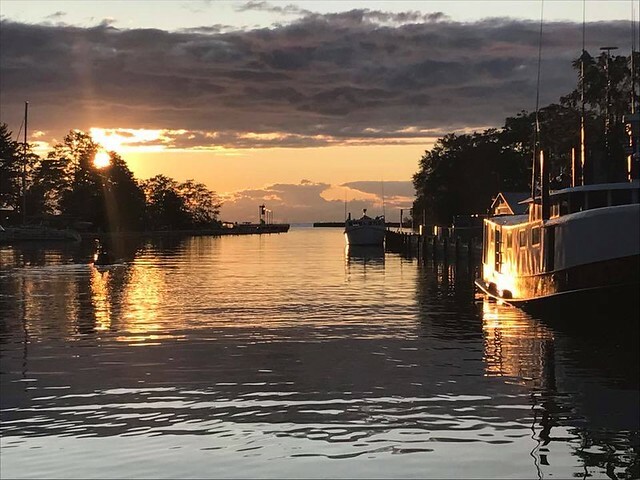 The petition entitled, “Preserve Bayfield, Ontario's heritage culture - say "NO" to corporate encroachment” that will be sent to the CAO of the Municipality of Bluewater Kyle Pratt. It was launched midday on July 11 and as of publishing time had generated 681 signatures. For anyone interested in viewing the petition please visit:www.change.org. The Bayfield Tree Project, which is funded by donations from villagers, is planning to again plant trees on municipal properties in front of residences here in the village. This project has planted nearly 500 trees over the past six years and the committee members are now asking that residents submit a request to have a tree planted in front of their house if they have not yet done so. In order to have a tree planted on your frontage, the committee asks that homeowners commit to watering and taking care of the tree (mulch, do not damage the bark); and if possible, they make a donation ( $20 plus - gets a tax receipt) in order to keep the project going. Every tree planted costs approximately $125. Anyone interested in participating in the project should please contact Sondra Buchner at tsbuchland@tcc.on.ca. Sept. 20 at the Bayfield Agricultural Park. The astronomy enthusiasts viewed, Saturn, Neptune, M3: a globular cluster, M31: Andromeda Galaxy, M33: Pinwheel Galaxy, M51: Whirlpool Galaxy, M57: Ring Nebula and M81: Bode's Nebulae. Everyone is welcome to join the WCA, with or without a telescope. Their next Star Party is 7:30 p.m. on Wednesday, Oct. 18 at the Agricultural Park in Bayfield. on the status of the event please call 519 868-6691. Any amateur astronomer, eager to bring their telescope, and share their knowledge with others, please call the number listed above. 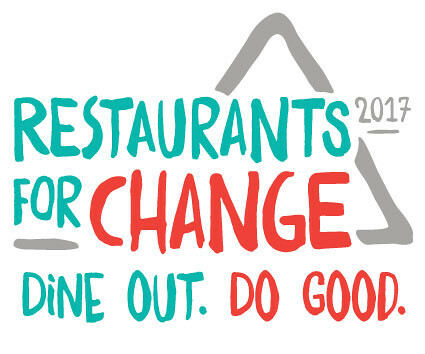 On Oct. 18, over 90 restaurants in 19 Canadian cities will join together to donate proceeds from dinner service to Community Food Centres Canada (CFCC), supporting community food programs that build health, hope and belonging in low-income communities across the country. Funds raised will directly support local Community Food Centres that bring people together to grow, cook, share and advocate for good food for all. Participating in the event is easy: Diners visit www.restaurantsforchange.ca to find a participating restaurant near them and make a dinner reservation for Oct. 18. Locally The Black Dog Pub and Bistro will be taking part. More than a dozen chefs from participating restaurants across Canada flew to Toronto on Sept. 17 and 18 to learn more about the issues of food insecurity, poor health and social isolation that affect low-income Canadians, and how CFCC is using food as a tool to build healthier and more inclusive communities. They then launched the Restaurants for Change campaign with a packed event at Baro restaurant, where they cooked their favorite dishes from their menus—dishes that Canadians can order when they go out for dinner on Oct. 18. Got milk? Bayfield Guiding has the cookies to go with it. The chocolatey mint Girl Guide Cookies are back for a limited time this autumn. They are selling now for $5 a box and are available from Bayfield Guiding members. If the chocolatey mint variety of cookie isn’t a favorite, not to worry, the girls also have the Classic Chocolate and Vanilla Sandwich cookies available for the same great price. Profits from the cookies are used to support the girls in their varied activities and to subsidize outings. Want to reserve a box or two? Please call Melody Falconer-Pounder at 519 525-3830. Dr. Rich Samuell at Main Street Optometric wants to let Bayfield residents know that full eye health examinations are available at his Bayfield office. Examinations are fully covered by OHIP for children and teens, seniors, and those with diabetes. Main Street Optometric uses current technology including a "no-puff" eye pressure check, as well as digital retinal photography to monitor for eye conditions like glaucoma, macular degeneration and diabetic retinopathy. Please call 519 565-2300 to schedule an appointment. While journeying on the path of a life-limiting illness, people are often asked about the setting in which they would like to spend their final moments. Some prefer to stay at home; some prefer to be in a hospital or a Long Term Care setting and some would love the opportunity to have the comfort of a hospice. Wherever the individual and family decide to spend these precious moments, the Huron Perth Palliative Care Outreach Team (PCOT) and Huron Residential Hospice (HRH) want to ensure the best support for each person. The PCOT and HRH aim to integrate resources to ensure that wherever an individual decides to palliate, at home or in their setting of choice, they will have access to the best resources. The PCOT specializes in end of life care and has the ability to support the patient’s symptom management in the community setting. They address complex symptom management issues in a timely manner thereby reducing hospitalization and allowing the individual to stay in the comfort of their home or setting of choice. It provides the unique opportunity to meet the needs of individuals in their home community and improve patient quality of life. Since the initiation of this team, more families have been able to support their loved ones in their home. The team members include Palliative Care Physicians, Nurse Practitioners, Pain and Symptom Management Consultants, Spiritual Care Advisors and Volunteer Program Coordinators. The team also works closely with the South West LHIN program manager who implements care plans, liaises between healthcare sectors and patient needs. The program manager acts as a system navigator, ensuring the care provided is seamless and barrier-free. Dr. Agnes Kluz is passionate about Hospice Palliative Care and has been advocating for its excellence in Huron County for several years. Dr. Kluz is the lead physician for the PCOT and has many roles such as coordinating and developing the frameworks for the Model of Care, developing and supporting education for physicians, and ensuring that care is delivered smoothly. The goals of the PCOT are to increase access to specialized Palliative Care, ensure dignity at the end of one’s life in the setting of one’s choice, and to decrease the dependence on acute care settings. Since the PCOT was initiated in February 2017 the team has made a significant difference in Huron-Perth as more individuals have been able to spend their final moments at home. HRH supports and will work in collaboration with the PCOT ensuring that everyone in Huron County has access to excellent Hospice Palliative Care. Referrals for the Huron/Perth PCOT are now being accepted throughout Huron and Perth County. Please contact your local Health Care Provider or HRH for more details. **Kailyn Pasma, RN, CHPCN(c), Huron Hospice Board Member. This year’s Behind the Bars evening tour program at the Huron Historic Gaol in Goderich was the most successful ever! The demand for this program was so high that the Huron County Museum has decided to host an encore production on Oct. 27th from 7-9 pm (last entry at 8:00 pm). Tickets for this event are being sold in advance on Eventbrite or at the Huron Historic Gaol during regular hours. For the first time ever, the Museum is hosting three evening Ghost Tours at the Historic Gaol - these events have also proved to be very popular as all three tours sold out in record time! Thursday evening Movie Nights in the Museum’s theatre are returning this fall. “Beetlejuice” will play on Oct. 19 and the “Rocky Horror Picture Show” will be featured on Oct. 26. Movie screenings are included in the regular admission rate and are free for Museum members. Beetlejuice will also be free to Huron County Library cardholders in celebration of Ontario Public Library Week. The Children’s Garden Project, hosted by the Friends of the Museum, continues this fall. This Saturday morning program is available for free to children aged eight to 10, but preregistration is required. Simply call the Museum to enroll. Kids will also be able to enjoy the Kids Sushi Workshop on Nov 3. Children aged eight to15 are invited to make their own sushi with Drift of Bayfield’s own Peter Keightley. Preregister now at the museum front desk or call 519 524-2686. The Friends of the Museum will again host their Halloween Main Street in the Museum’s History Hall on Oct. 31 from 3:30-8 p.m. This event is free and open to all. There is always something new and exciting happening at the Museum and people won’t want to miss a minute of it. A great way to save is with the purchase of a Museum Membership these can be purchased at the front desk for only $30 for student/senior, $40 for individuals or $60 for families. Memberships allow unlimited regular admission to the Museum and the Gaol plus regular admission to four other great Ontario Museums. Visit the Museum’s website at www.huroncountymuseum.ca to learn more. The 2017 International Plowing Match and Rural Expo (IPM) had a busy and exciting day on Friday, Sept. 22 with good weather, great crowds and lots to see and do. The day was capped off by the Celebration of Excellence banquet – celebrating the winners of the BMO Plowing Competition and the crowning of the Queen of the Furrow. The Banquet was held at the Brussels arena and is the final event in the Queen of the Furrow program. Throughout the week, the 25 local county Queen of the Furrows had participated in numerous activities and events and had toured much of Huron County. Judging for Queen of the Furrow is based on their performances in: Plowing Ability, Appearance and Deportment, an Interview, a Speech and Impromptu Speech. Kailey Donaldson, from Halton County, was crowned 2017-2018 Queen of the Furrow. 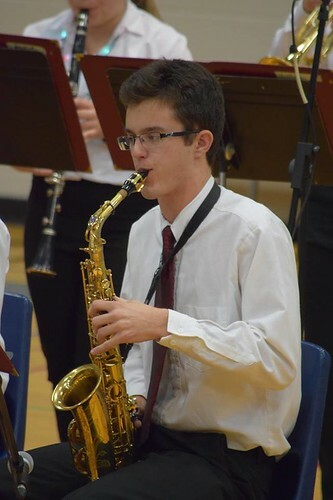 Donaldson grew up in Acton, ON and has been an active 4-H member for years. She is a graduate of the University of Guelph, Ridgetown Campus. The new Queen was honored with a car for the year courtesy of the Ontario Plowman’s Association (OPA), as well as a scholarship. First Runner Up was Caleigh Van Kampen, of Peel Dufferin, and Second Runner Up was Andrea Chesney, of Oxford Blenheim. Two other finalists were Josie Linton, of Durham County and Olivia Bolender, of York County. These young ladies will continue to contribute their time over the course of the next year along with the other 25 county Queens representing and educating their communities in regards to farming, agriculture, business and volunteerism with the OPA. There are a number of special awards offered as part of the Queen of the Furrow program. BMO Bank of Montreal donated two Scholarships to the participating Queens – the scholarships are chosen randomly and the winners were Chloe Croghan, of Grenville County and Billie Diemert. of Grey Normanby. Diemert was also honored with the title of Miss Friendship. The top five Queens of the Furrow recognized for their plowing skills were honored with a $100 scholarship from the OPA. This years top finishers were: first, Caleigh Van Kampen, of Peel Dufferin; second, Olivia Bolender, of York County; third Josie Linton, of Durham; fourth, Shannon Little, of Perth; and fifth, Michaela Lievre, of Oxford County. Congratulations from the IPM and OPA is extended to all the competitors. A thank you is also extended to all of the program organizers, judges, and sponsors. 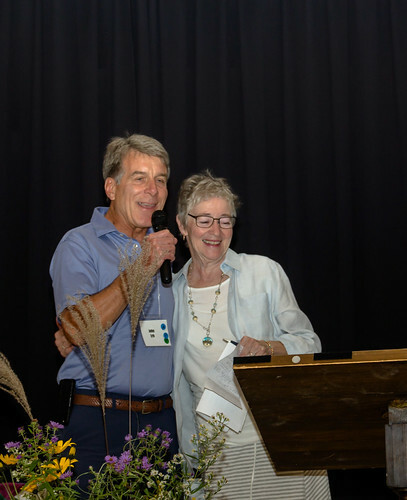 A special thank you is given to the Anita Rastapkevicius, outgoing Queen of the Furrow 2016-2017, from OPA directors and staff, as well as the executive of IPM. From now until Oct. 8, the LCBO is launching a second round of their ‘Giving Back in Our Community’ campaign in 17 stores across Perth and Huron counties to benefit United Way Perth-Huron (UWPH). To support this fundraiser visitors to the LCBO can make a donation when an LCBO employee at their local retail location asks if they want to give $10, $5 or $2. In 2016, the LCBO donated more than $52,000 to United Way Perth-Huron. In fact, the LCBO is the single largest United Way contributor province-wide from the Ontario Public Service sector. These generous donations from the LCBO and its customers come at an important time; at a kick-off lunch in Stratford on Sept. 15 and Tour through Huron and Perth Counties on Sept. 18, UWPH announced a courageous goal of $1,556,445 for the 2017 campaign. United Way Perth-Huron is 100 per cen local and supports almost 50 organizations and services across Perth and Huron Counties. To help United Way continue supporting these local services, donations are gladly accepted. For more information call 519 271-7730 or 1-877-818-8867, mail to 32 Erie Street, Stratford,ON N5A 2M4 or visit perthhuron.unitedway.ca. The 16th annual CKNX Healthcare Heroes Radiothon will be back on the airwaves of AM920 and cknx.ca Saturday, Oct. 21 to raise funds for eight local hospital foundations. The Clinton Public Hospital Foundation aims to raise $20,000 towards the purchase of new sterilization equipment for the Medical Imaging Department. Pledges towards this goal can be made in advance of the Radiothon by mail, in person or at www.cphfoundation.ca. Pledges can be made live during the Radiothon by calling 1-877-CARE-4U. People are invited to tune into the broadcast all day on AM920 and cknx.ca or catch hourly check-ins on 101.7 The One and 94.5 Classic Rock. Listeners will hear heartwarming patient stories, descriptions of the medical equipment needs at each participating hospital and listeners will be treated to one-of-a-kind musical performances. proceeds to benefit the Clinton Public Hospital Foundation’s Radiothon project goal. The Kinsmen wills serve up a delicious breakfast for a donation. cknx.ca. Visit the website to enter the story writing contest, download the pledge form, donate online and learn about the eight participating hospital foundations and their fundraising projects. Need some trees to fill a space or create a windbreak? Consider buying from Bluewater Communities in Bloom and support a positive community-wide effort at the same time. Communities in Bloom (CIB) sprouted seven years ago from an idea to bring villages, lakeshore and farming communities together. It brings together passionate volunteers and unique initiatives. The program involves creation of a community profile book, or brag book, professional judging in the provincial competition and a handful of local beautification and environmental programs. New members for the Bluewater Blooms Committee are always welcome. For more information contact Secretary Nellie Evans at 519 236-4351 Ext. 236 or email nevans@municipalityofbluewater.ca. The fall schedule of the Hensall Heritage Hall was released recently. The Hall will welcome the Classic Country Show with CCR featuring, Elton Lammie and Wendy Lynn Snider, on Oct. 14. Tickets are $30 and available from Kathy at 519 263- 2343, Carolyn 519 262-3444, or Liz 519 262-2715. Tickets are also available at www.ticketscene.ca or D&D in Hensall. 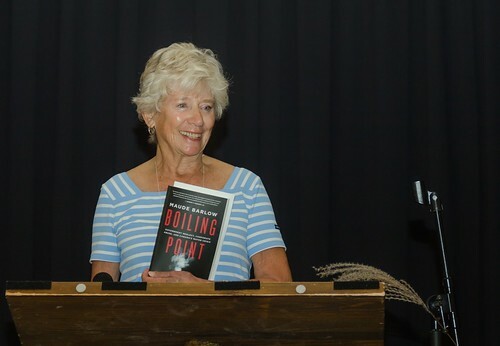 Canadian bestselling author and international activist Maude Barlow was the morning keynote speaker. Gayle Waters (pictured) introduced Barlow and welcomed her back to the village. People interested in small communities came to hear a number of experts, including morning keynote speaker, Maude Barlow, in various aspects of environmental sustainability with a particular focus on how rural villages can make meaningful change in the fight against Climate Change. Philip Keightley, M. Sc., P. Eng, is a professional engineer and Bayfield resident. He described how increases in climate change guarantee that we’ll all have to deal with the effects of more extreme weather in the future. He is shown here with Elise Feltrin who acted as Mistress of Ceremonies at the event. The Summit had the support from a number of expert local workshop facilitators and other volunteers. Tom Davis, a Professor in the Donald J. Smith School of Building and Technology, sat in on a discussion among participants at the summit held in the Bayfield Town Hall. 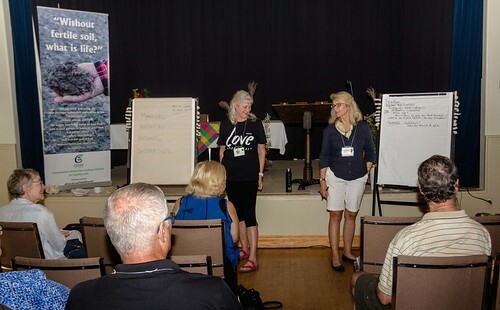 Jen Pate, local environmentalist and social entrepreneur, shared her love story for the Great Lakes at the portion of the summit held at the Bayfield Lions' Community Building. Mari Veliz, Healthy Watersheds supervisor at the Ausable Bayfield Conservation Authority (ABCA), discussed both rural and urban storm water management best practices, focusing on the rain garden that was built in Bayfield. 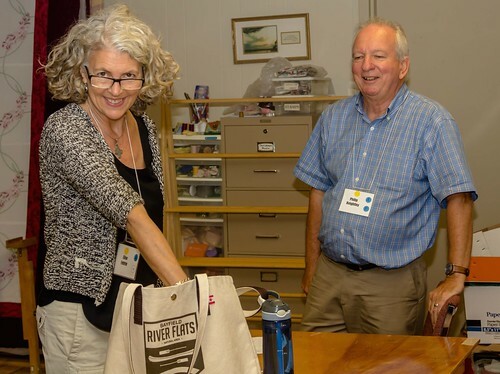 The Bayfield Sustainability Summit, titled, ‘Big Solutions for Small Communities,’ had a sellout registration at the Bayfield Town Hall on Saturday, Sept. 23. People interested in small communities came to hear a number of experts in various aspects of environmental sustainability with a particular focus on how rural villages can make meaningful change in the fight against Climate Change. After an introductory welcome from Bluewater Mayor Tyler Hessel, Summit MC Elise Feltrin welcomed the enthusiastic group who came from across southwestern Ontario and Michigan. Feltrin gave a welcome to all and thanked Summit sponsors RTO4 , Bayfield and Area Chamber of Commerce and the Municipality of Bluewater for the support. The Summit had the support from a number of expert local workshop facilitators and other volunteers. The afternoon keynote speaker was Tom Davis, a Professor in the Donald J. Smith School of Building and Technology. 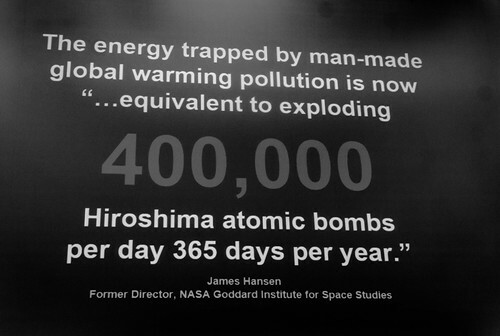 Davis gave a dramatic and sobering presentation outlining the history and the causes of climate change. He also outlined the solutions to mitigating climate change offering practical solutions for everyday people to lower their carbon footprint and live sustainably. He furthermore discussed how modern building techniques offer net-zero energy solutions as demonstrated by new student buildings at Fanshawe College in London that are leading the way in responding to climate change. Detroit Zoo Environmental Manager Rachel Handbury highlighted the Zoo’s sustainability projects, current and future, including their Anaerobic Digester which converts ‘poo at the zoo’ into compost and methane fuel. The Zoo has also successfully weaned its visitors off single-use water bottles, and is looking to install Tesla solar roof tiles in the future. Handbury’s informative presentation and workshop offered suggestions as to the ways in which municipalities and universities can create less waste and lower their energy use at the same time. In her presentation, Jen Pate, local environmentalist and social entrepreneur (www.loveyourgreats.com ) shared her love story for the Great Lakes – a unique tale of people’s passion for their local waterways and their willingness to instigate meaningful change for a healthier future. 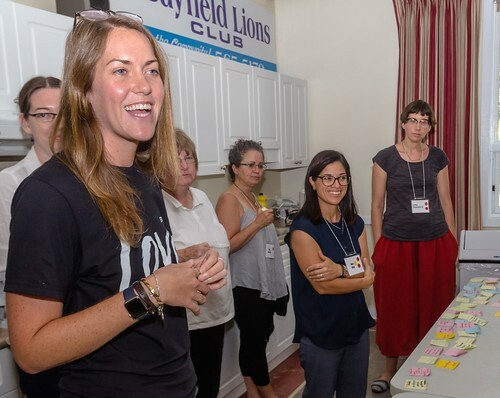 In her workshop, participants provided meaningful and actionable solutions to dealing with plastic pollution all the way from the source to the lake and beyond. 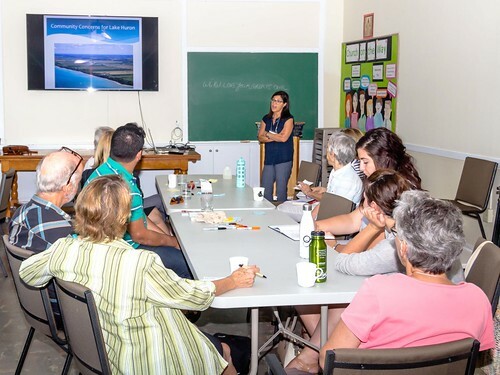 Mari Veliz, Healthy Watersheds supervisor at the Ausable Bayfield Conservation Authority (ABCA), discussed both rural and urban storm water management best practices, focusing on the rain garden that was built in the Village of Bayfield. During rainstorms or periods of melting snow, the run-off created picks up contaminants that can then flow into large bodies of water … lakes and rivers that are a source of drinking water for nearby communities. Shallow, sunken gardens appropriately called rain gardens protect local water quality by collecting, absorbing and filtering this run-off. Rain gardens not only reduce flooding and erosion they can also create habitat for wildlife and add beauty to a community. Philip Keightley described how increases in climate change guarantee that we’ll all have to deal with the effects of more extreme weather in the future. This will have a major impact on our civil infrastructure, yet traditional engineering solutions seem out of reach for small municipalities experiencing increasing budgetary constraints. Keightley presented ideas and examples of simpler and more practical solutions that are appropriate to small communities. The Blue Bayfield Committee was delighted to invite local area high school students and the response was very positive .Approximately 10 students were able to participate in the sessions. All presenters made note of the importance of young peoples' involvement as they are the future change makers. Blue Bayfield is an organization of concerned citizens located in Bayfield. Its mission is to reduce the use of disposable plastics and prevent plastic and pollutants from entering our Great Lake and waterways. 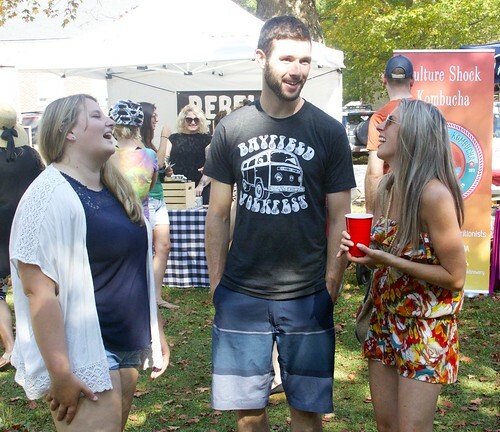 Blue Bayfield spearheaded the drive to install multiple water bottle refilling stations throughout the village, providing a mobile water unit (Blue Betty) at events and locations where no potable water is available. This was made possible through donations from the community, in conjunction with the Municipality of Bluewater. Blue Bayfield also hosts and participates in beach and park clean ups, educates the local community on this important topic and encourages action! It works alongside many other local community groups, businesses and government to help create a sustainable environment from land to lake. For more information click on www.bluebayfield.ca. 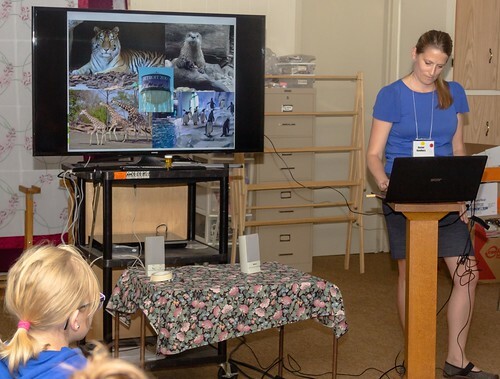 Detroit Zoo Environmental Manager Rachel Handbury highlighted the Zoo’s sustainability projects at a portion of the summit held at St. Andrew's United Church. A fact from the summit. 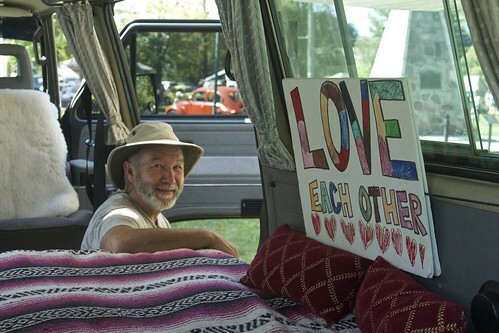 Johm Beattie, of Windsor, ON, sits in the Volkswagen Westfalia that he and his wife got for their 40th wedding anniversary at the third annual Volkfest held in Clan Gregor Square on Sunday morning. 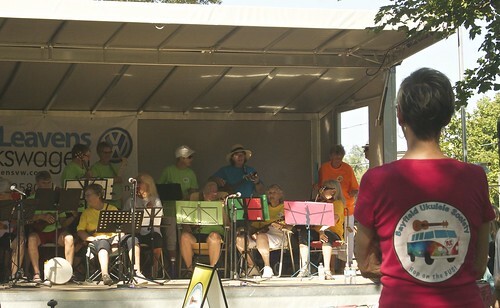 Nancy Moore surveyed the stage filled with members of the Bayfield Ukulele Society prior to their performance at Volkfest on Sunday morning. 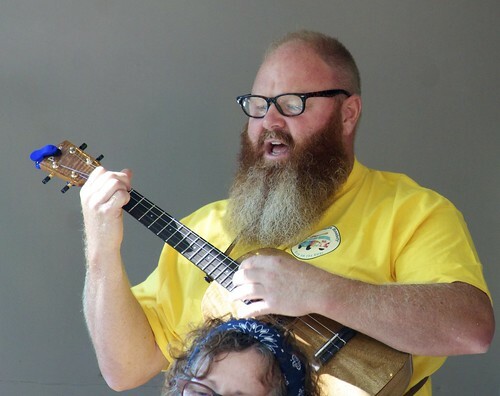 Not only did Todd Baker perform with the Bayfield Ukulele Society at Volkfest he also participated in the Beard Competition. 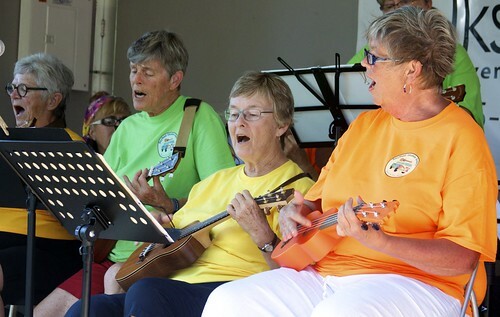 L-r: Sondra Buchner, Lucia Schatteleijn and Shelagh Sully performed folk songs suited to the pinnacle era of the VW during the Bayfield Ukulele Society's performance at Volkfest. 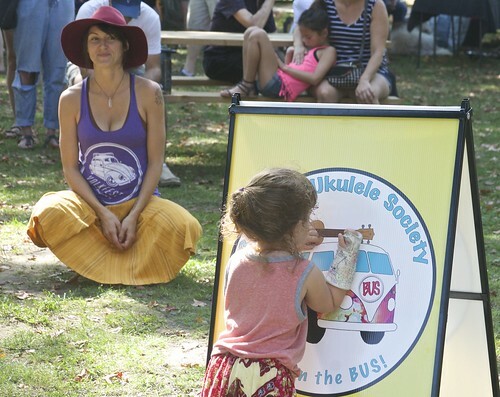 Mom Jennifer Reaburn watched as her daughter, River, "played" the Ukulele on the Bayfield Ukulele Society's sign. The crowd shows their appreciation for the performance by the Bayfield Ukulele Society. 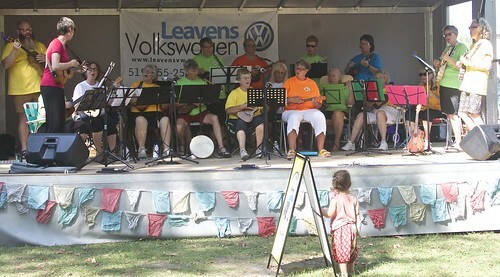 Members of the Bayfield Ukulele Society filled the portable stage provided by the Bayfield Lions' Club. It proved to be one of the hottest and humid days of 2017 but that didn’t keep the large crowds away. 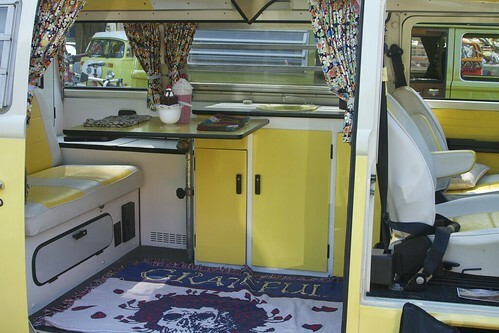 The cheerful interior of a 1978 Volkswagen Westfalia owned by Pete and Simone Young, of Kilworth, ON - an anniversary gift! 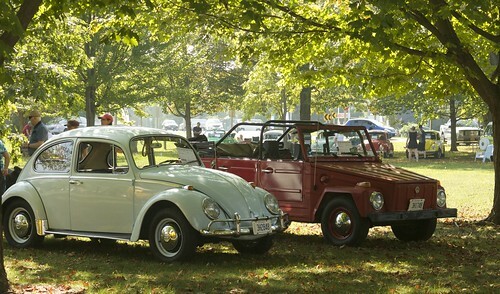 The “People’s Car” returned to Clan Gregor Square on Sept. 24 and so did the people as the third annual Bayfield Volkfest celebrated all things Volkswagen with a tremendous turn out of Vintage Volkswagen Vans, Campers, Beetles and other Volkswagen designs from a variety of eras. A new event was the Beard Contest (beard and moustache) sponsored by Wisers Whiskey, Windsor; The Bayfield Beauty Shop, Intuitive Sense by Maggie, River Road Brewery and Elephant Juice. A number of handsome, Grizzly Bear types had their facial hair judged by Marcie McLean. The food booth and craft vendor circle grew substantially over last year with jewellery, upcycled drums, musical instruments, art as well as healthy food and drink products being offered for sale. 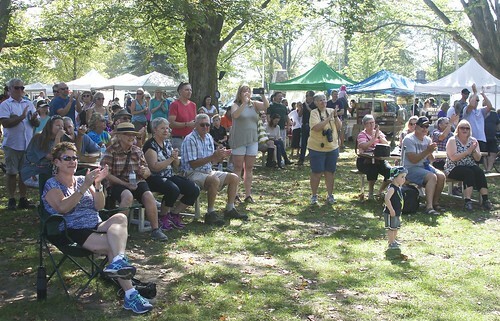 The Bayfield Lions’ Club’s portable stage was the place to gather around to listen to some fabulous music by Josh Geddis, Celtae Lynne, Andrew & Veda, The Honey Sweethearts and the Bayfield Ukuele Society. The weekend event included a camping opportunity at Hartman’s Pond in Dashwood with camper vans parking there on Saturday night. 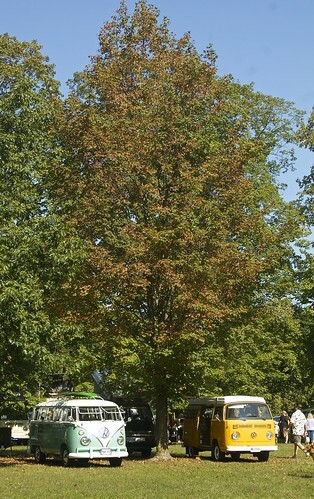 There was also a caravan to and from Grand Bend on Sunday morning with VW owners enjoying brunch at Smackwater Jack’s. It proved to be one of the hottest and humid days of 2017 but that didn’t keep the large crowds away. All seemed to be enjoying the good vibes, swaying to the music and breathing in the smell of incense that hung in the air. Spirit Drums was a vendor at Volkfest. 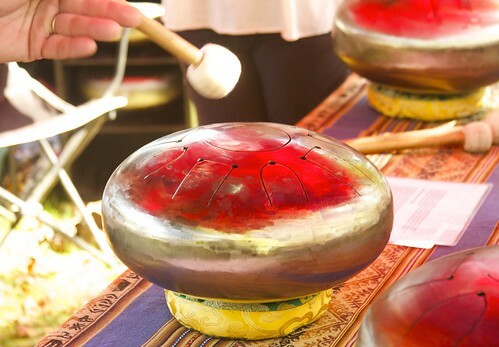 According to their website, "Each instrument is uniquely handcrafted, from recycled materials, tuned to 432Hz for optimal health and healing through music and sound reverberations." 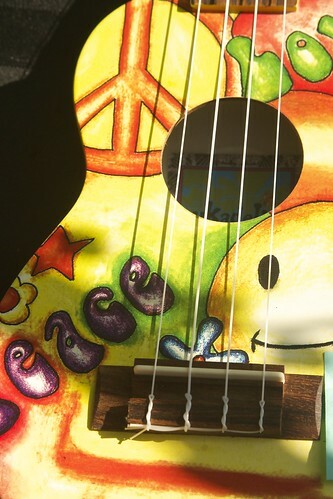 Pianovations from Blyth had a booth at Volkfest offering up some finely designed Ukueles. Visitors to Volkfest and event volunteers share a laugh. 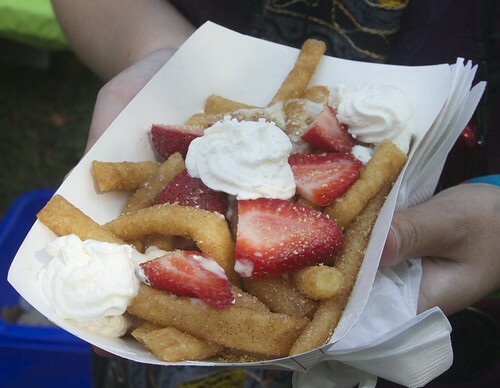 Several food vendors provided good eats at the festival including this decadent dessert offered up by the Wicked Witches of West Street Food Truck from Goderich. 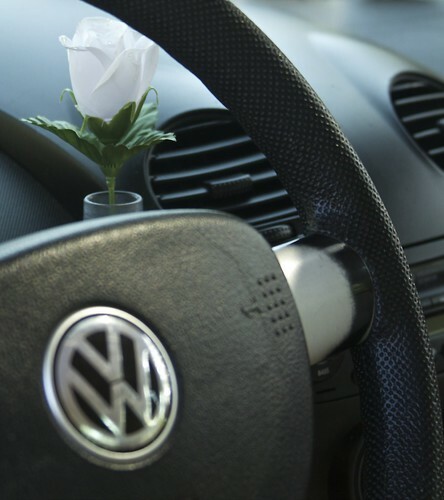 VW offered a porcelain "blumenvasen" from the very beginning and the vase became a US dealer option in the early 1950s. The weekend event included a camping opportunity at Hartman’s Pond in Dashwood with camper vans parking there on Saturday night. 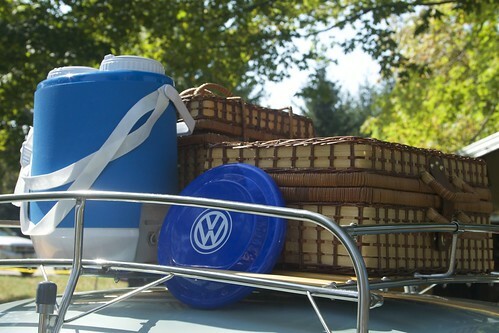 Volkswagen accessories helped to make the vehicle displays all the more interesting. 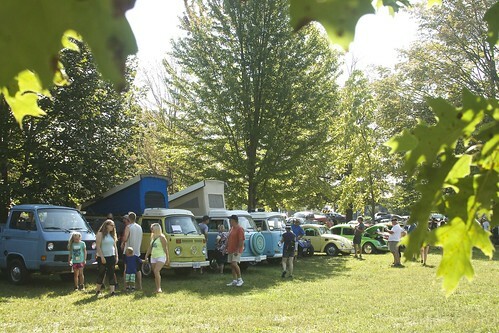 The third annual Bayfield Volkfest celebrated all things Volkswagen with a tremendous turn out of Vintage Volkswagen Vans, Campers, Beetles and other Volkswagen designs from a variety of eras. Three decades a part parked side by side. 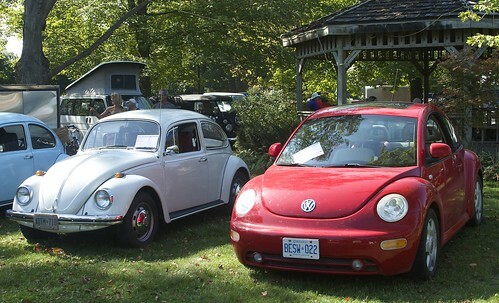 On the left, a Deluxe Beetle from 1969 owned by Rob Gillespie, of Sarnia, ON and on the right a 1999 VW owned by Ken Coutts, of Grand Bend, ON. Today you are reading the 430th weekly issue of the Bayfield Breeze. I thank you for scrolling all the way down to the bottom to see what I have to say. We are brought to your email inbox each week because a number of people advertise their service or business throughout the issue. I encourage you to click on their advertisements and tour their websites to see what they are all about. We wouldn’t have been able to create this 430th issue if it weren’t for them. That’s right, folks, it is that time of year again when our Advertising Representative Mike Dixon is out pounding the pavement checking in with returning advertisers and hoping to enlist a few new ones too. It takes more than the time and enthusiasm of our merry little band to put out an issue every week. It takes money – albeit we do our best to be frugal. There are costs to send out our weekly emails, costs for domaine services and costs to host the wonderful myriad of pictures that make our publication rather unique, I think.